1. Mix the yogurt with ground almonds, lemon juice, garam masala powder, coriander powder, cumin powder, turmeric powder and red chilli powder. 2. Marinate the chicken legs in this mixture for 10 to 15 minutes. 3. Heat oil in a large pan. 4. Add the onions, ginger and garlic for about 5 to 8 minutes or until the onions are transparent and slightly brown. 5. Add the tomatoes and chicken stock cube. 6. Cook for 3 to 5 minutes and add the marinated chicken legs. 7. Saute for 4 to 5 minutes. 8. Remove chicken and place in an ovenproof dish. 9. Keep in a preheated oven at 180C/350F for about 45 minutes to 1 hour. 10. Turn the oven off and let it be inside the oven for 20 minutes. 11. Remove and transfer to a serving dish. 12. Stir well and serve with rice or chapati. 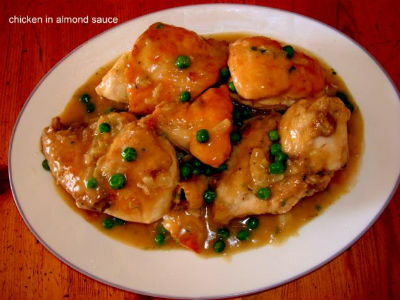 Feel free to comment or share your thoughts on this Chicken with Almond Sauce Recipe from Awesome Cuisine.